I love modern crime dramas, but I also love science fiction. I’ve often wondered if there was a credible way to consolidate the two without sacrificing the integrity of either. Judging by the international trailer for Looper, it seems that writer/director Rian Johnson and I are on the same page. The film tells the story of Joseph Simmons (Joseph Gordon-Levitt) the 25 year old “Looper” referred to by the film’s title. He’s a professional assassin that operates out of Kansas City in the year 2042. His employers, a criminal organization known as the “Gat Men,” operate out of Shanghai in the year 2072. They capture people in the future and send them back in the past, where Joseph efficiently disposes of them. He carries out each hit with cold detachment and is handsomely paid for his services. One day, during a routine job, he recognizes an intended target as his older self (Bruce Willis). This causes him to hesitate in pulling the trigger, allowing the target to escape. Joseph soon learns that his older self has a plan to hunt and kill the Rainmaker, a future crime boss whose very existence threatens all that Joseph holds dear. Faced with this bit of information, the younger Joseph is forced to decide how much his own future matters to him. 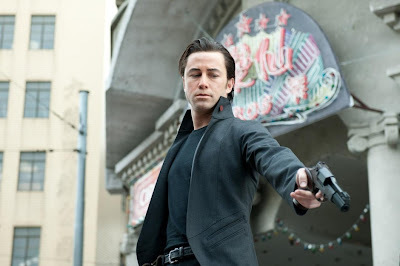 The plot of Looper sounds like a cross between The Terminator and just about any other movie featuring a hitman working his way through an ethical dilemma. It also puts a nice twist on the central idea of Logan’s Run. What happens when the hunter becomes the hunted? It’s easy to be detached from your work when you’re the one behind the trigger, but what happens when the barrel is pointed at your own head? This international trailer places such questions front and center, allowing them to exist alongside the shiny visuals without being completely overwhelmed. The film’s premise also raises other questions (which will likely turn out to be gaping plot holes and paradoxes). Chief among these is the Pauli Exclusion Principle, which states that no two particles of matter can occupy the same space at the same time. If Looper chooses to address that, hopefully it will not do so as absurdly as Timecop. I’m willing to pay the price of admission to find out, which is how I know that this trailer has done its job.